MIAMI? A comet plunging into the sun has been captured in 3-D as it hurtled alongits kamikaze path for the first time, solar physicists announced Monday. "Webelieve this is the first time a comet has been tracked in 3-D space this lowdown in the solar corona," said solar physicist Claire Raftery, apost-doctoral fellow at UC Berkeley. Fourpost-doctoral researchers at UC Berkeley's Space Science's Laboratory usedinstruments aboard NASA's SolarTerrestrial Relations Observatory (STEREO) spacecraft to track theso-called sun-grazing comet as it approached the sun. They were able toestimate an approximate time and place of impact. NASA'sSTEREO mission, which launched in 2006, is actually made up of twin spacecraftthat orbit the sun, one ahead of the Earth and one behind it, and providestereo views of the sun. Sun-grazingcomets are made up of dust, rock and ice. These comets are rarely trackedas they speed toward the sun because their brightness is overwhelmed by the solardisk. Butevery now and then, a comet stands out in views from sun-watching spacecraftlike STEREO and the Solar and Heliospheric Observatory (SOHO). Thecomet seen by Raftery and her fellow researchers apparently survived theintense heat of the sun's outer atmosphere ? called the corona ? anddisappeared in the chromosphere, which is a thin layer of plasma found betweenthe visible surface of the sun and the corona. Thecomet eventually evaporated in the scorching heat that reaches almost 180,000degrees Fahrenheit (close to 100,000 degrees Celsius). Rafteryand her colleagues, Juan Carlos Martinez-Oliveros, Samuel Krucker and PascalSaint-Hillaire, concluded that the comet was probably from the Kreutz family ofcomets, a group of Trojan or Greek comets that were ejected from their orbit in2004 by the gas giant Jupiter. Theresearchers also concluded that the sun-grazing comet made its first and onlyloop around the sun before crashing and burning. Theresearch team presented their findings today at the 216th meeting of theAmerican Astronomical Society. Thecomet first caught Martinez-Oliveros' attention after it was mentioned in asummary of observationsby SOHO and STEREO in March. Thecomet's long, brighttail of dust and ions distinguished it as a sun-grazing comet, and assumingthat it was going to loop around the sun, the researchers decided to monitor itand see whether the STEREO data were good enough to allow them to accuratelycalculate its trajectory. Theyfound that the data was so precise that they were able to chart the comet'sapproach for two days prior to impact. Theresearchers were able to estimate the impact zone within a circle about 620miles (1,000 km) in diameter. They then pored through online data from theMauna Loa Solar Observatory to determine if they could spot the comet next tothe sun's edge in the ultraviolet region of the spectrum. Whatthey found was a short trail that lasted about six minutes and was only a fewthousand miles above the solar surface in the sweltering corona andchromosphere. Sincethe comet had a relatively short tail ? about 1.86 million miles (about 3million km) in length ? the researchers believe that the comet containedheavier elements that do not evaporate as easily. Thiswould also help explain how the comet was able to penetrate so deeply into thesun's chromosphere, not only surviving the extreme temperatures but the strongsolar winds as well, before finally evaporating. 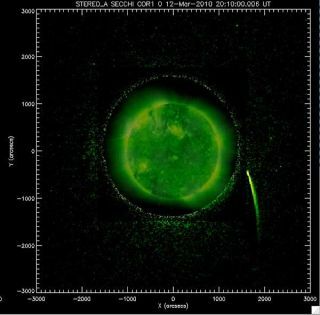 Fortheir study, the team used the two coronagraphs on STEREO A and B and multipleinstruments on SOHO, "demonstrating the importance of multi-viewobservations of non-solar phenomena," the researchers wrote in thepresentation of their research. Theresearchers also used data from the ground-based Mauna Loa Solar Observatory,located on the flank of the Mauna Loa volcano in Hawaii, and found images ofthe spot they had predicted the comet to impact at, whichappeared to show acomet approaching the edge of the sun from behind the solar disk. Themembers of the research team, who all normally study explosive events on thesun, said that their foray into cometary physics was unplanned. "Itwas supposed to be an exercise, but it took over our lives," Raftery said.